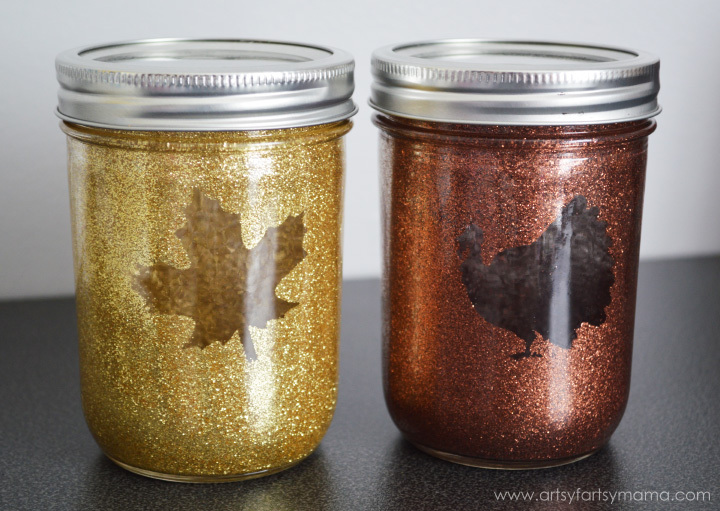 Looking to make a quick craft for your fall or Thanksgiving decor? 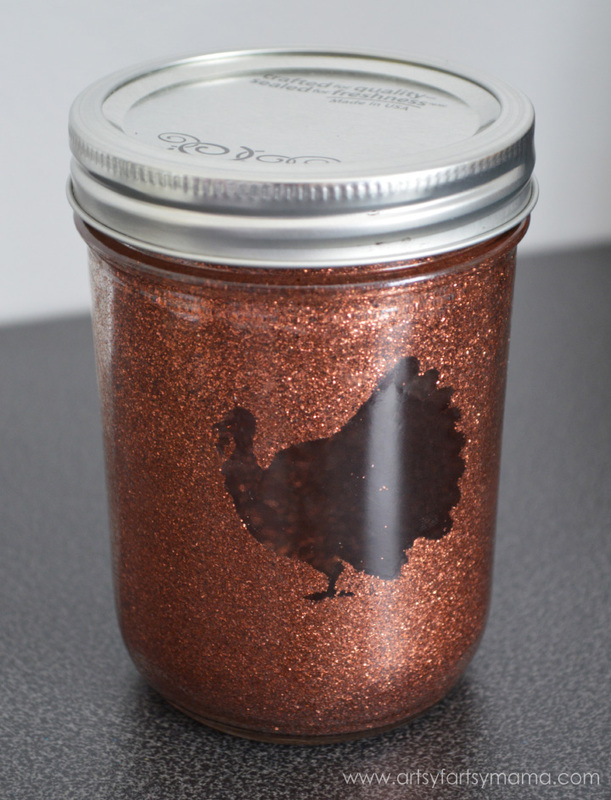 These glittered Thanksgiving mason jars come together quicker than you think, and are super affordable! They'd be fun to make for a girl's night before the holiday, or they would look fabulous as your Thanksgiving table centerpieces. The supplies are found almost anywhere, and you might already have some of it at home already! First, clean your mason jar and let dry completely. You can even clean with alcohol after washing it to make sure it's completely clean. Cut out a fall or Thanskgiving shape out of vinyl with a Cricut Explore or other vinyl cutting tool (you could also hand cut a design if you don't have a machine). Any color of vinyl will work just fine. You'll be throwing it away when you're done with the project, so pick something you aren't too attached to. Also, remember to reverse your image if you are cutting text instead of an image!! 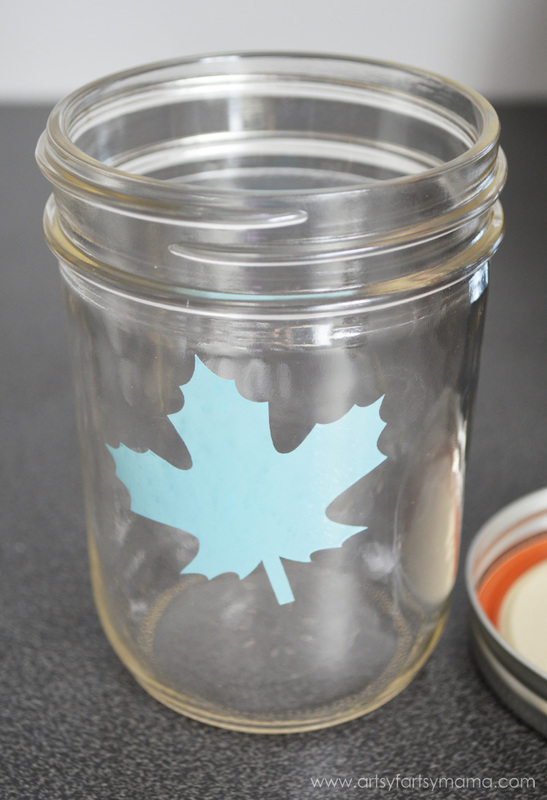 Stick the vinyl on the inside of the jar. Press the edges down until it's stuck on well. You'll be able to see if there are any bubbles or edges that need to be worked out. Now comes the messy (but fun) part!! I highly recommend getting some disposable cups ready before you start to help keep your mess down to a minimum. Plastic or paper cups both work well. Pour in some Pledge FloorCare Finish and slowly swirl it around the jar. Try not to shake it or you'll get bubbles. If you do happen to get bubbles, just wait a minute or so and they'll disappear. As you turn the jar in your hands, start to tip the jar at an angle so the jar gets covered by the wax. You'll be able to see where the wax has covered. Hold the jar over a cup and keep turning as you pour the excess wax into the cup. Hold upside down for a second or two to help the extra wax drip off. Pour the cup of excess wax back into the container. Next, my favorite part!! Pour in some glitter. Tip: pour more than you think you'll need!! Repeat the turning/tilting step and you'll immediately see the glitter sticking! 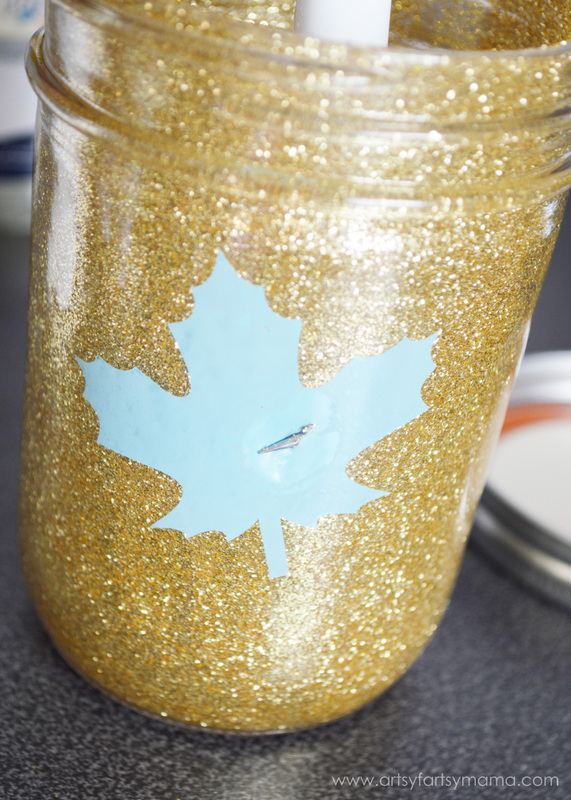 Keep turning & tilting the jar over a different cup and slowly pour out the excess glitter. 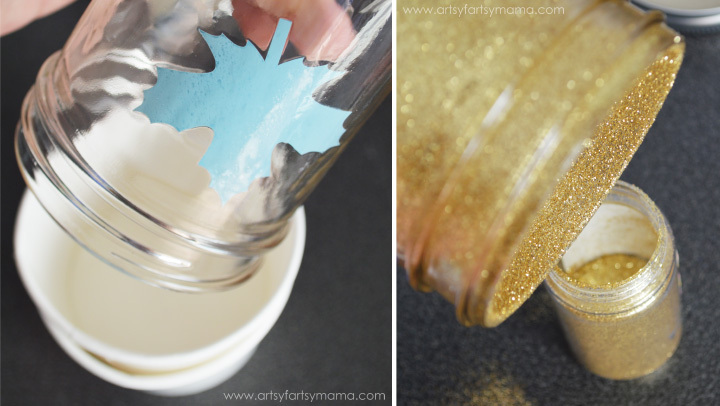 You can reuse the glitter, so use the cup to pour the extra glitter back into its container. Now your jar is covered! Let it sit for a few minutes to dry a little, and make your other jars at this time. 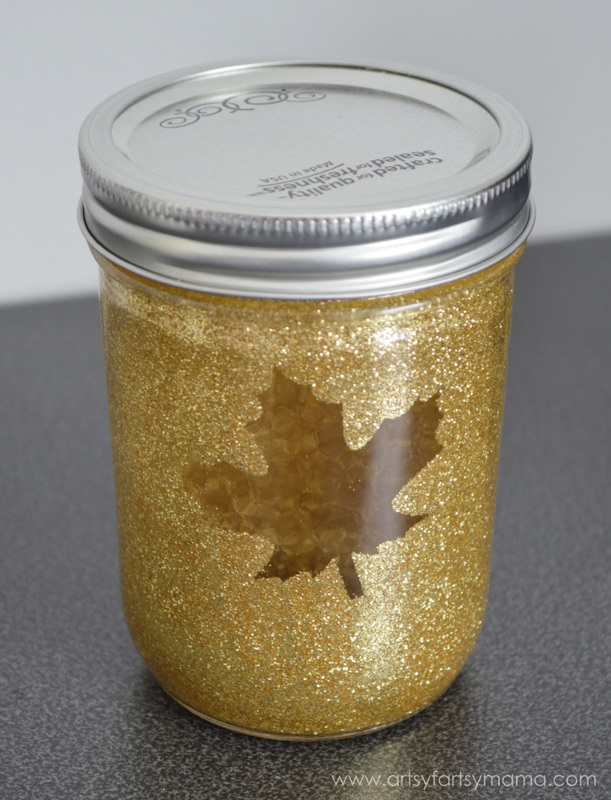 You can keep reusing the same wax and glitters for as many jars as you need. To remove the vinyl, I have had great success using the weeder and tweezer tools from the Cricut Tool Set. The edge of the weeder is nice and sharp, and the tweezers hold tight with minimal effort on your part. You can use similar tools if you have them, but I really do love these tools and highly recommend them. To remove the vinyl, carefully start by putting the weeder tool in the jar and poking a hole in the vinyl. You'll be able to see that you got it through the glass. Once you've made the hole, work the weeder tool into the vinyl and slowly and carefully pull the vinyl away from the glass. Once you have an edge up, you can unhook the weeder tool and use the tweezers to pull the rest of the vinyl off. Just remember to work slow and watch what's happening on both sides of the glass so you don't scratch any glitter off. If you accidentally scratch some off, you can use a q-tip to dab on some floor finish and put more glitter on to cover it up. Once your vinyl is removed, your jar is finished! Let it sit uncovered overnight to dry completely and to air out. You can also add embellishments to the lid if you want, or just leave it as-is. 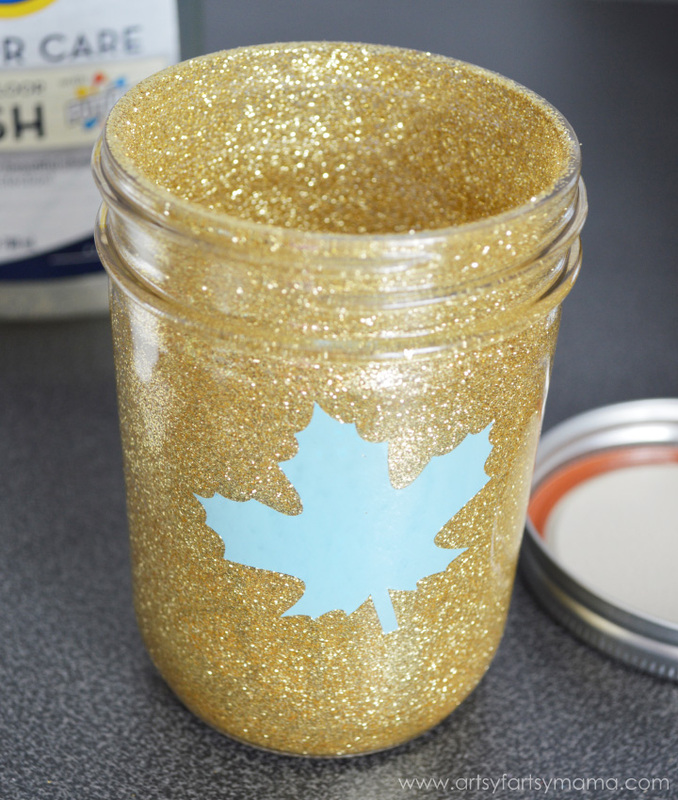 Any color of glitter will work fantastically, and the possibilities are endless when it comes to designs. Just keep in mind that simpler, larger designs will work better than smaller, more intricate ones. You lose a little bit of detail on smaller areas (check out the turkey's foot). 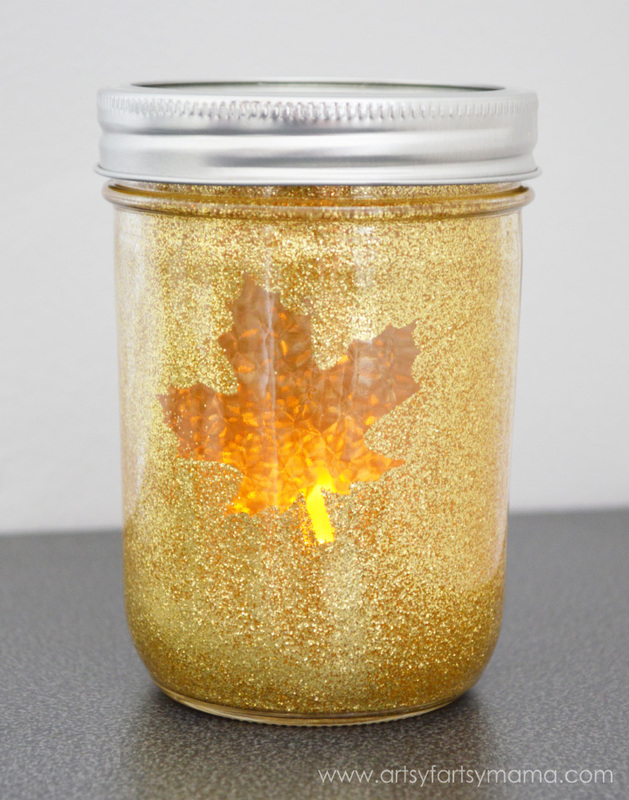 Once your jars are dry, you can add in a battery powered tea light to the bottom of the jar for a little ambiance. I highly recommend using tweezers to put the tea light in so that you don't accidentally scratch the inside of the jar. Even though it's dry, you can still rub off some of the glitter. Place the jars on a shelf, mantel, or on your Thanksgiving table for some easy but beautiful autumn and holiday decor! I'm a sucker for glitter!